I like modern art; I really do, but, if we go to MOMA in NYC or even to a modern exhibition at, say, the Philadelphia Museum Of Art, I have a basic test for the simple question, "Is it really art?" Could I have done it in five minutes or less? If the answer is yes, then it's not art. Four chairs set up around a light bulb? Not art. A blank canvas? Not art. I don't care if it was intended to speak to the plight of whomever wherever. Not art. On the other hand, weird splotchy paintings, weird twisty sculptures, etc? Those are art. This is not a tough test. What does this have to do with recipes? It seems that if you can tell exactly how to make something from the name, the "recipe" maybe isn't a recipe at all. It's just a good idea. But sometimes something is so delicious that you don't care. Let's take the case of the bacon-wrapped, goat-cheese stuffed dates. You pretty much figured out how to do it already, I bet. It is The World's Greatest Party Food. We have to go to an Oscars party tonight. (Yeah, I know.... I haven't seen any of those movies either, but the party is fun. This particular one always involves good food, and, get this, all the whisky drinkers bring a different single-malt scotch for a "tasting." It's the one time all year that my wife drives me home). 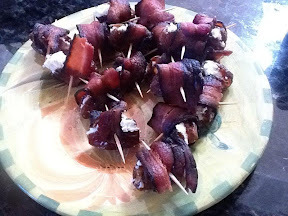 Anyway, we are bringing bacon-wrapped, goat-cheese-stuffed dates, and, as always, they will be devoured in no time. Cook a lot of bacon. Now here is the catch. If you use the good bacon, like the bacon at the meat counter at Whole Foods, the big long strips of that stuff, e.g. the "black forest bacon" ..... wowzers, will allow you to wrap each date with one-third of a strip of bacon. But, as a bacon aficionado, a man (or woman) about town of the bacon set, you might think that you want a little extra bacon involved in the wrap -- say, half a slice for each date. This is a reasonable conclusion. Have at it. Some higher mathematics should lead you to count the number of dates you are going to stuff/wrap and then divide that number by two or three to determine how many strips of bacon to cook. Then add a few more strips because you *know* you are going to eat some as you are making this. While the bacon is cooking, slice each date just enough to get the pit out, and remove that thing. Stuff each date with goat cheese. You're about to ask me how much goat cheese. This is always a source of debate. For instance, I already think my wife didn't buy enough to stuff the dates that she bought for tonight's party. But we will see. She is usually right about these things. But, to be safe, like the bacon, err on the side of "it's always cool to have some left over because it's so delicious that it won't be around long anyway." Oh, and yeah, I know... Goat cheese isn't paleo. This is a party. Lighten up, Francis. I am not telling you this is breakfast food. Now, there's two ways to do the next part. You can heat the stuffed dates in the oven for a few minutes at 350 degrees F or so, just to melt that cheese a little. And then wrap 'em with the bacon, using a toothpick to hold the bacon on. Or, you can wrap 'em first and then heat 'em up. I like the end result of this latter method better, but don't burn the bacon! In other words, this requires you to be more careful, but the results are even better. (Not the best pic, I realize, but, hey, we should be pretty clear at this point that this is not art). what a great post! if i ate bacon i would definitely give these a try! (what a dumb comment) i think i'll just go eat some dates though... too funny about the non-art! i just discovered your blog, looking forward to reading more! The Cory Weissman story. You need to read this. New and improved! With a Facebook page!